Today I am thrilled to announce the release of my fifth book! Yep, kind of stealthy with this one, but I believe it’s an extremely important and timely topic. 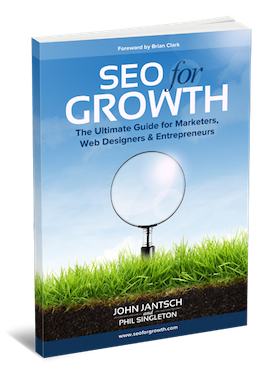 The title of the book is SEO for Growth – The Ultimate Guide for Marketers, Web Designers, and Entrepreneurs. I had the pleasure of collaborating with SEO pro Phil Singleton on this one and my good friend Brian Clark of Copyblogger contributed the foreword. SEO is no longer a disconnected, highly technical practice relegated to hacks and tricks aimed at fooling Google. No, SEO today is a foundational element of all online strategy and must be made a part of even the most basic marketing decisions. There are a lot of technical SEO books out there, but this one was written to help elevate the role of search engine optimization to the strategic level of marketing. This book is a must read for anyone that needs to better understand or buy marketing services today. In addition to teaching people SEO, our hope is that this book will also equip marketers to spot the scam artists trying to sell SEO related services. The book is available in paperback and Kindle versions today! And, of course, I have a limited, but awesome bonus offer for those who grab a copy of the book right away! “SEO for Growth is stunning in its practicality and relevance. Every reader will make money, save money, or both thanks to this guide.